He added that it is Jesus who is ‘the light of the world, the light that shines in the darkness of the world, the darkness of grief and sin, a light by which we learn to take just the next step’. In the counsel of St Paul to ‘be like children of the light’, the Cardinal said that ‘we have a task to discover what the Lord wants of us in any particular situation, and to be like children of the light means to do our best with kindness and compassion and courage’. As the Apostle admonishes that we should ‘have nothing to do with the futile works of darkness’, so the Cardinal urged that for Christians, this means that we must ‘have nothing to do with talk of hatred or retaliation; have nothing to do with bitterness, or scorn, or mockery, or gossip, or all that undermines who we are individually and together as children of a common Father’. At the beginning of Mass, the Cardinal remembered individually those who had died in Wednesday’s attacks: PC Keith Palmer, Kurt Cochran, Aysha Frade and Leslie Rhodes. He also explained that, as Christians, it is our duty to ask for God’s mercy on the soul of the attacker. The Mass was offered for the victims of the attacks, especially those who had died, at Westminster Cathedral on the Fourth Sunday of Lent, Sunday, 26th March. 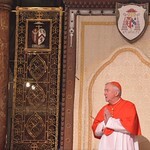 The full text of the homily can be found here.